This is The Book’s basic mayonnaise recipe, there are 7 other dressed up mayonnaises which use this recipe as a starting point, so I’ll be making it a bunch of times. As with most of the basic recipes in the book, it’s solid, but not exciting. However, that’s not a bad thing. I made the mayo recipe from the ‘76 edition of The Joy of Cooking, and it was a disaster. Joy is often considered the home cook’s go to source for no-fail basic recipes, and you’d think they’d have a rock solid mayo method, but no. Mayonnaise is made by whisking an egg yolk with oil a drop at a time to get an emulsion started, then pouring in a staggering amount of oil in a slow stream while whisking madly. Once the mayo is thickened and the emulsion is no longer at risk of breaking, you can add extra flavourings. The crazy Joy method would have you add mustard, salt, cayenne, lemon juice, and confectioners sugar before you start the emulsion at all. The mustard is a common addition because it helps the emulsion form, but adding the lemon juice is just stupidity. The acid fights the emulsion you’re working so hard to build, why would you put it in there? I whisked for about 20 minutes before I could get a thin soupy consistency. It was an OK salad dressing, but a horrific mayo. The Book’s method is much more logical, and worked very well. In this recipe an egg yolk is whisked together with Dijon and salt, then 3/4 of a cup of oil are added first by drops then in a slow stream. Once the mixture starts to thicken to the point that it’s getting difficult to whisk, and the emulsion is solid, you add a bit of white wine vinegar, and lemon juice. Then the remainder of the oil is added in a stream, and salt and white pepper are stirred in. The mayo wasn’t quite as thick as I would have liked. You’d be better applying this with a spoon than a knife. But, it was silky smooth, and nicely glossy. I might have cut 1/2 a teaspoon of liquid somewhere to keep the mayo thicker. The flavour was pretty good, it had the eggy richness I look for in a mayonnaise, with a little bite from the vinegar and lemon juice, and a background body from the mustard. It was very nice spread on a sandwich, and quite a bit better than the the stuff that comes from a jar. My only real complaint was the instruction to use either olive oil or vegetable oil in the recipe without further specification. Depending on your olive oil it can have a very pronounced taste, which is great for some applications, but it can make for a very weirdly flavoured mayonnaise. I made mayo at my brother’s place a few weeks back, and the only oil he had was olive, that mayo was edible, but none of us liked it much. It lacked the mellow feeling I’m looking for in mayo, all of those grassy spicy flavours I enjoy in good olive oil where just unpleasant and distracting when they were so amplified. If you’re going to use all olive oil, I’d recommend using very mildly flavoured oil, preferably not extra virgin. I think the best tactic is to use a small amount of good olive oil for flavour, and then use a flavourless oil for the rest of it (canola, or grapeseed would be my first choices, using about 1 part olive oil to 3 parts other oil). Mayonnaise is quite easy to make, and homemade has a definite edge over the store bought kind. I’ve always been disturbed by the fact that Hellman’s is made with real eggs, but keeps for months. Without all of the shelf-stable preservatives this mayo will only keep for two days. Since it’s really not much trouble to make, and it tastes better than the miracles of food science on the grocery shelf, I’ve been getting into the habit of making my own. This recipe uses a solid method, and it’s a jumping off point for a lot of interesting variations. It won’t blow your mind, and I’ve had better homemade mayo, but it’s worth trying at least once. Joy has long been my kitchen bible (it was the first cookbook bought for me when I left home), and I feel irrationally compelled to defend it. I have the ‘97 version so I thought I’d see if they’d updated their mayo recipe for a more sophisticated audience. 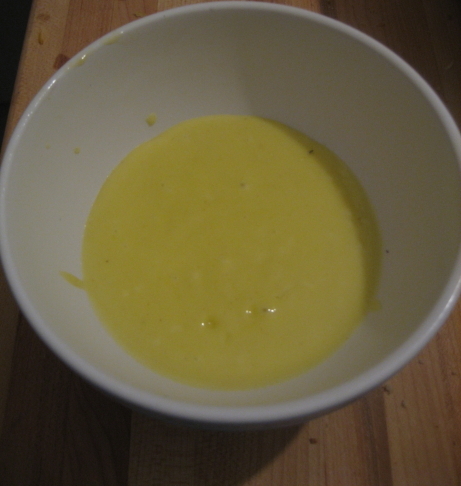 Now the emulsion starts with just egg yolks, salt, pepper and, yes, still some lemon juice (or vinegar). The mustard is omitted until the final step, and the cayenne and confectioner’s sugar (!!!) are gone altogether. The oil you choose will be the predominant flavour in your mayonnaise. Made entirely with a robust olive or walnut oil, the sauce will suit equally full-flavoured foods — rich meats and aromatic vegetables, for example. For delicate foods such as poached fish, a milder oil is recommended. When mayonnaise is to be the base for other flavours, make it with mild-tasting peanut, safflower, grape-seed, or corn oil… Usually three parts mild to one part fruity oils is about right. They also note that oil that’s been sitting around on the shelf for a while will generally have its staleness amplified by being mayo-ified, which may explain why nobody much liked your olive oil mayo. There’s also a long discussion about the various factors that can prevent emulsification, but (in defence of their lemon juice, I suppose) they are adamant that “real” French mayo is only optionally thick enough to spread — so having it soupy enough for a salad dressing may well have been intentional. One final point I would make is that those early editions of Joy often seem pretty horrendous, but this is usually just because the audience back then simply didn’t demand what we would regard as good cooking. I have my grandmother’s first edition from the Thirties, and some of the directions in there seem horrific. They’d have you “soft” boiling eggs for almost twenty minutes (new Joy says four, at the most), and boiling broccoli for thirty (new Joy says eight, at the most). So, in summary, back off! It would appear that Joy has a Posse. I agree on the merits of the book in general, most of the time it does a great job with walking users through common kitchen tasks (and preparing squirrel should the fancy take you). The ‘76 version has a similarly robust intro to mayo, and mentions oil considerations. It was a very well written recipe, but I’d like a mayo that can thicken to more than nappe, no matter what the French think. I’d be very interested to find out how yours went if you have the time to whip up a batch. Ha. My mum’s family was always Joy and my dad’s family was always Fanny Farmer, so there have been extremely acrimonious cookbook debates in my house. And the Joy posse eventually won out, too, so look out, The Book. You crazy foodies are blowing my mind. Nothing in the world should be taken this seriously, except perhaps the timeless Romulan vs Klingon debate.